The Vickers Wellesley was a single engined light bomber that saw brief service with the RAF during the Second World War. 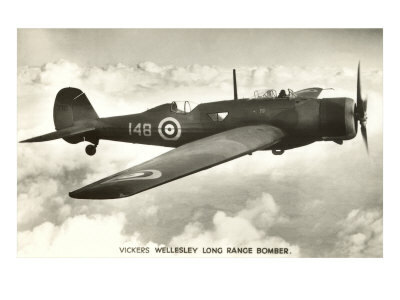 The Vickers Wellesley was a single engined light bomber that saw brief service during the Second World War. It is often overlooked, both because of its more famous cousin the Wellington medium bomber, and because it served in the Middle East and Africa rather than on the home front. Obsolete early in the war (a contemporary of the Bristol Blenheim) it nonetheless held several distance flight records for many years and served from 1937 to 1941. Predating the war and designed in 1935, the Wellesley was built as part of the British rearmament process in the lead up to the Second World War. Made of metal covered with fabric, it was the first aeroplane to use the geodetic construction method, and unusually for a bomber the Wellesley carried its bombs on panniers under the wings. Soon after entering service, it set a distance record with a flight of seven thousand miles from Ismailia to Australia, landing at Brisband. 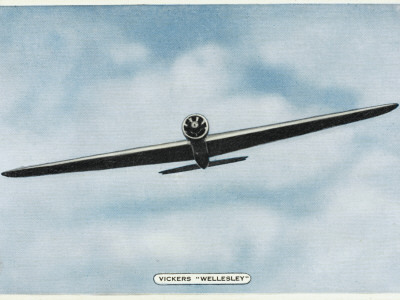 Like many aircraft designed between the first and second world wars, the Wellesley was eclipsed by aircraft developed during the war. Its lack of defensive firepower meant it was a sitting duck for fighter attack. In 1938, a squadron of three Wellesleys flew non-stop in formation from Ismailia, Egypt to Darwin, Australia, setting a new long distance record of 7,157-mile (11,494km). It took them just over 48 hours, and remains a record-breaking flight even today: the longest flight by a single piston-engined aircraft. 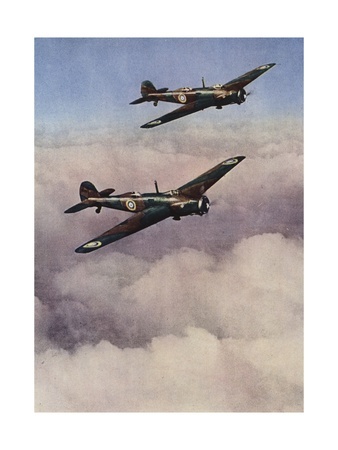 However, it was a contemporary of the Bristol Blenheim, and both aircraft found themselves quickly obsolete as wartime advances left them behind. The Wellesley's main contribution to the war in Europe was to prove the success of its construction method, which was then used to produce its cousin, the incredibly robust medium bomber the Vickers Wellington. Developed by Barnes Wallis, Geodetic construction involved a body of criss-crossing (and those self-reinforcing) struts covered by fabric. It provided a strong, yet light weight airframe ideal for bombers and capable of taking damage. While it played little part in the war in Europe (with a top speed of 225mph, the faster dual-engine Blenheim had largely replaced it in Britain) the Wellesley served with distinction in the Middle East and Africa during the war. Despite being far slower than the modern aircraft, and lacking firepower, it was simply the only aircraft available. Functioning as a bomber and reconnaissance aircraft, the Wellesley served in North Africa from 1940 until 1942, when it was finally phased out. * A squadron of three Vickers Wellesley set a distance record for continuous flight for 7,000 miles. There are also models of the Wellesley available. The Mk1 Wellesley had two seperate cockpits, but there are rumours the MK two had only one. 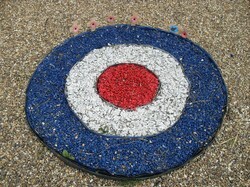 There are no surviving Vickers Wellesley aircraft, and certainly no flying survivors. The newsreel and the Wellesley bombers world record distance attempt. This was successful with a flight of over 7000 miles. Memories of the Wellesley? Think there's something missing off the lens? Please let me know here. The Bristol Blenheim, often called "The Forgotten Bomber", was originally built as a civillian plane before the second world war. Quickly outperformed, it is often overlooked.